A slender, boldly marked bird, this specics lives in forest, woodland, and scattered trees. 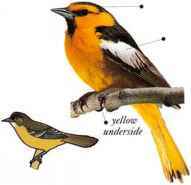 Pairs forage at various heights in the trees, but typically low down, taking insects and fruit. They do not join mixed flocks. • NliST A loosely woven bag made of plant fibers, hanging from a branch. 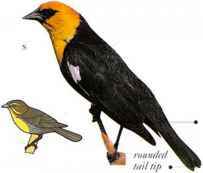 • REMARK This bird is often regarded as a race of the Troupial detents icterus). 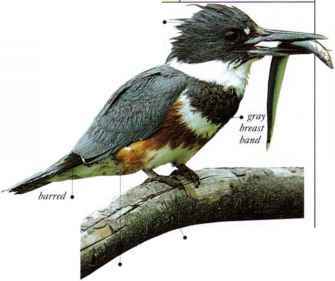 I his bird lives in tall trees in forests and open woodland, hunting insects and also taking berries and other fruits. • NliST A deep, purse-shaped nest made of long plant fibers, slung from the tip of a branch. • DISTRIBUTION Breeds in S. Canada, much of USA, and Mexico. Winters in Central America, Colombia, Venezuela, Cuba, and Jamaica.